I can't login on my desktop without captcha due to too many login attempts. However, the recaptcha is not working and is asking me to direct site owners to upgrade the captcha system. edit: see downthread for a workaround - apparently typing 'v1' as the captcha answer will solve the captcha. Last edited by Madge on Thu Apr 26, 2018 8:46 am UTC, edited 1 time in total. There was a gap in registrations on the 15th, but 18 accounts have joined the site since then so it seems this part of the problem, at least, is fixed. I still see an unavailable recaptcha when I try to log in or register an account. I'd post a screenshot but I'm on my phone. Can someone please reset the login flag for me if that's possible? I've "replicated" this issue in Windows 10 and Kubuntu. (Got these on Chrome/Chromium in both instances). If anyone is still looking at this I can confirm the above issue, at least when it comes to trying to register a new account. Also Chrome/Win 10.
okay, that was the scariest 12 hours of my life, I got locked out of my account on all of my devices (:O) and started panicking and decided to try resetting my password, which it turned out also reset the "too many logins" flag on my account so I'M BACK, BABY. So the issue is still a problem for new signups, but you don't need to reset the login flag on my account. 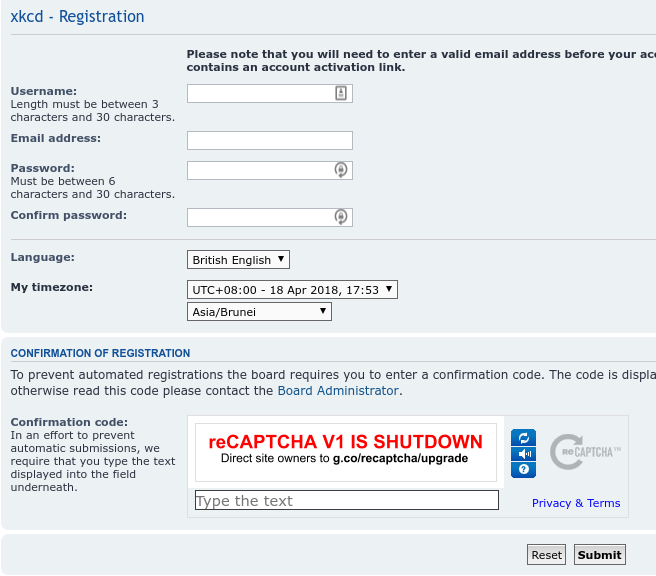 The captcha still is broken for new registration, it seems. Google’s official solution is updating to version 2. I don’t know if it’s possible to pass the captcha in this state (considering there have been accounts registered since then, it seems like it’s possible), but for security, it is probably better to upgrade. It looks like they simply don’t process api call for v1 anymore. Haven't quite had cause to test out the local interaction, but have been dangerously close to it as I had problems in the last couple of days with this device being unable to be charged while out on the road (my usual solutions having serially failed to be available for different reasons compunding upon each other) and I was beginning to worry about getting the login right if I had pursued access by alternate machines that I'd not used before. So good luck, TPTB, in getting it fully resolved. For all the systems for which the advanced upgrade announcements apparently never really arrived intact from the vendor. As we've just been reminded by the talk surrounding the currently penultimate comic, https://xkcd.com/1028/ probably covers some of what we're seeing. I hope people stuck dealing with the outrage of the ultimate end-users are bending the earsmof those back at CAPTCHA-central, so that if/when V3 migration has to happen that it goes by without quite so many upset people at all levels. Ok, just for anyone that needs it, typing "V1" solves the recaptcha. It worked for me. No soup for you! It looks like you have been flagged as a spammer. If you feel this decision was made in error contact the board admin. "v1" worked for me (lower case, upper case did not work). I also tried audio, so that may have triggered something. Whatever workarounds may have worked earlier seem to have stopped, based on dates of new user registrations. The anti-spam step has now been changed away from recaptcha, if anyone wants to verify that it works again.